Ten people were killed and 13 others injured after a Greek F16 fighter jet crashed at Albacete airbase in central Spain, the Defense Ministry reported. Along with the Greek pilots, eight French nationals were reportedly among the dead. The plane exploded in the parking zone of Los Llanos airbase in Albacete. The accident happened at about 3:20 PM local time. "The plane, part of the Tactical Leadership Programme of NATO was carrying out a (training) exercise when during take-off the plane lost power, crashing into the parking area for planes, crashing into various planes that were parked there," the defence ministry said in a statement. “It appears that there were two Greek nationals and eight French among the dead,” Spanish Prime Minister Mariano Rajoy said in an interview with Spanish television channel Telecino, according to France24. At least two dozen people have been wounded, including 10 French and 11 Italian nationals. The victims were underneath parked planes when they were injured. "I am deeply saddened," said NATO Secretary General Jens Stoltenberg in a statement. "This is a tragedy which affects the whole NATO family. Eight of those injured are in serious condition. Three are in resuscitation, two are in intensive care, and one more is being operated on. Three others have inhaled fumes, sources at Albacete hospital told Cadena SER radio network. 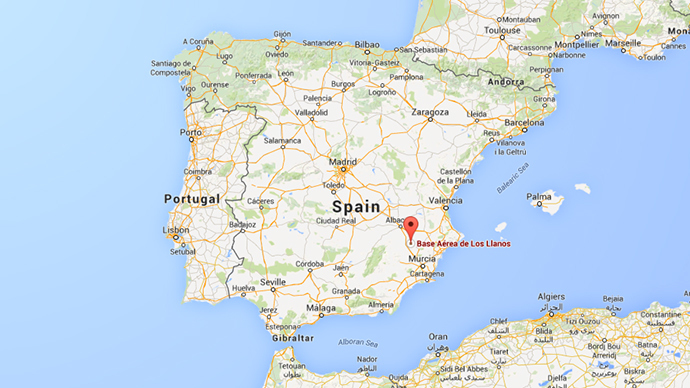 According to abc.es, two French planes overhead during the incident had to land at San Javier base in Murcia, 140 kilometers away. The Spanish defense minister and the Spanish Air Force (JEMA) chief of staff have reportedly headed to the site. Los Llanos airbase that is taking part in NATO’s Tactical Leadership Program (TLP). Advanced pilots are training to enhance their skills and overall air force effectiveness.